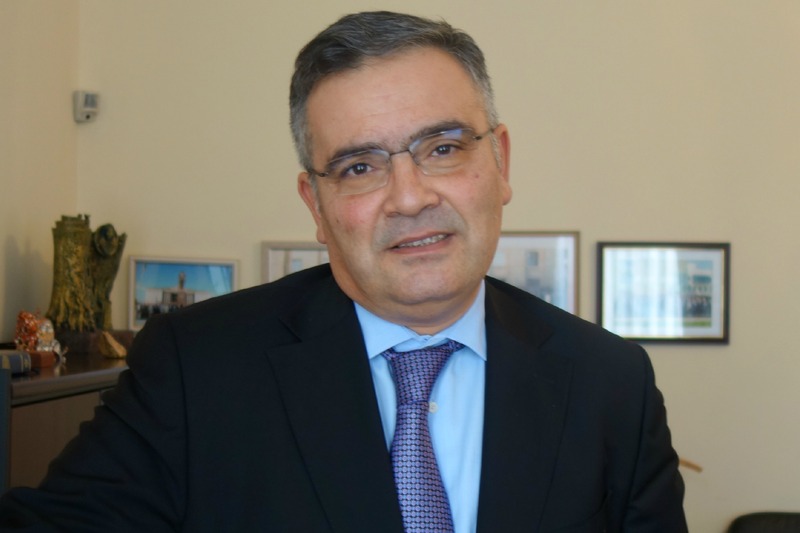 Fuad Isgandarov has previously served as ambassador to the Netherlands and ambassador-at-large. He has also been deputy minister of the Ministry of National Security of Azerbaijan. He was speaking to EURACTIV’s senior editor Georgi Gotev. Azerbaijan is increasingly in the international spotlight, as it is organising the first European Games next June. NGOs have criticised your country for human rights violations and infringements on media freedom and freedom of expression in the run up to the event. How do you respond to such criticism? This happens not for the first time. Just ahead of the 2012 Eurovision song contest we saw the same phenomenon. It was the first time Azerbaijan won the [Eurovision] award [in 2011] and we had to arrange in a very short period of time the hosting of the contest. And I was told, “Oh, we have a practice of doing this on the eve of such kind of events”. And that they did the same with China, on the eve of the Olympic Games, on the eve of the football World Cup in Brazil, there were so many critical articles about Brazil, about the situation with human rights, about the demolition of houses for building sporting stadiums, the same was with China. We are not exceptional. But perhaps they target countries who find it difficult to respond? I don’t think so. My country is happy to host such events just to put its name on the map, without any political ambitions. We are a young country, a developing, booming country, and we have no other political ambition except sustainable development of the nation, a friendly neighbourhood and integration in appropriate directions. But I would like to respond to some critical issues that were raised in your media source. Your media portal quotes NGOs who raise the question why the EU should have energy deals with countries where human rights are allegedly violated. Azerbaijan was mentioned, I will not mention the others. But sorry, Azerbaijan is a very young country, just 24 years old. Norway is also an energy supplier to Europe. Can you compare Azerbaijan and Norway with their democratic, their statehood experience? I don’t think so. But if you compare Azerbaijan with other energy suppliers, which have much more years of independence, you will realise that Azerbaijan, being a European country has more progress in political reforms and democracy. What is important is the number of cases in the European Court of Human Rights. Some EU member states have more cases in ECHR than Azerbaijan. OK, NGOs criticise the EU for having gas deals with certain countries. But what is their proposal? Don’t work with these countries? Don’t have any deals with these countries? First, it’s the EU who needs gas and oil. Second, such cooperation could be used to make the gas and oil producing countries closer to Europe, closer to the European values, closer to democracy. If to the contrary we would seek distance, this doesn’t look to me as a wise neighbourhood policy. But why doesn’t your government simply solve the issues for which it is criticised? I saw the recent press release of Amnesty International. It mentions a number of cases, why doesn’t you just solve them? I think Amnesty should be more critical. They mention a few cases but they should mention a million more cases. They don’t mention a million refugees who lost as a result of the occupation by Armenia of our territories. This is a huge violation and the victims are more than one million citizens of Azerbaijan. Instead, they mention a few cases that are under investigation, but excuse me, if I see on the one hand five, six seven cases mentioned, but nothing about the millions of refugees and displaced persons, what do you think my Azerbaijani response would be? Can I trust such analysis or not? This is the first question. And second, I don’t think there is a country in the world that is perfect. We are not an exception. I don’t think we are the one country that should be criticised. We see so many problems in European neighbourhood. But still, we are targeted. I don’t want to name countries, but so many people have been put in jail for political reasons, some have been killed during demonstrations, and there has been no statement from the European Union, no resolution from the European Parliament. Is this a double standard? Why is exactly Azerbaijan targeted? Can you explain what killings you refer to? In Armenia for example. After the first election of the president [Serj Sargsyan], how many people have been killed there? Eight? Ten? Nothing happened? No statements at all. Maybe the Armenians have a stronger lobby. What does it mean? If the issue of human rights is an issue of lobbying, I’m speechless. But Mr Ambassador, everything is an issue of lobbying, especially here in Brussels, and you know that. We are going to Europe with a $45 billion project, a third which is our money, from the pocket of Azerbaijan. I’m speaking about the Southern Gas Corridor (SGC). Do we need to make additional efforts to lobby? Do you know another country from the Eastern Partnership who is investing in Europe, or going to Europe with its own money? We don’t need any lobbying. We are already paying a lot. I got your point. But I’ll repeat myself; maybe it’s not enough. You said yourself the Armenians in a way are more successful because they are not criticised. But this is not because of state lobbying; it’s because of huge support from the diaspora. I think the best lobbying for the country is to do something in favour of strengthening relationships. Lobbying is a tactical issue, but when it goes to strategy, the best option is to have mutual interest for a long period of time. And we do have it with the SGC. And frankly speaking, we assess the SGC as a huge economical and commercial foundation upon which we can build a very serious political dialogue. About everything, about human rights, about democracy, about social issues, about multiculturalism. On Wednesday (4 March) Commissioner Johannes Hahn, announcing the start of the consultation on the future of the Union’s neighbourhood policy, said that the Commission should perhaps change the current system of issuing country reports. We can assume that countries like Azerbaijan who don’t have the ambition to be associated with the EU would not be scrutinised in the same way as countries who want to join the EU. Do you think it’s a good idea? Generally speaking, it’s about a tailor-made approach with the Eastern Partnership countries. I agree with it. Azerbaijan, Armenia, Belarus, Ukraine, Georgia and Moldova are different countries, with different attitude, with different estimations and different content of our relationship. For example, Moldova, Georgia, Ukraine, they have association agreements with the EU, they have estimations about joining the EU. OK, fine, we don’t have such estimation. You are basically saying Moldova wants to join the EU, and they will be scrutinised very thoroughly. Azebaijan doesn’t have such an ambition, so the Commission doesn’t have to apply the same kind of scrutiny. Of course. Our goal is to create a huge, strong, long-term economic basis for our political dialogue. We have 52% of our trade turnover with the EU, not with others. So we have a very pragmatic approach to have a sustainable economic basis, on which we can build political dialogue. An equal, future oriented, pragmatic approach based on strategic partnership agreement. Unfortunately, “Double standarts” is still actual for Europe.